Do you have trouble falling asleep on warm summer nights? Well, you're not alone. Your pooch too can find it hard to find comfort on a hot day. Although your dog might be active and full of energy, you may have noticed that they enjoy sleeping for a good portion of the day. Given that they sleep so much, it is important to ensure their bed is suitable for the temperature, and during the warmer months your pooch will be looking for a cool place to relax. Some dogs, especially breeds with long fur or with a double coat can overheat on hot days. They may have trouble sleeping on and may even get heatstroke if their temperatures are not well managed. Cooling beds are just one way to help your dog cool down and avoid uneccessary dehydration or heatstroke. There are many types of cooling beds to choose from based on your dog's size, where you'll keep the bed and whether or not you want it to be filled with water or gel. Gel cooling beds are comfortable as they provide extra cushioning for your pet as they rest, however some dogs find the consistency of the gel under their bodies awkward and some may even fear stepping onto the gel cooling bed. While they work quite well, they do not cool as much as a water bed would. Water cooling beds are also a great option as they can easily be put into the fridge or freezer (as can gel beds). They are also quite soothing for pets that have arthritis or oesteperosis and have even been used post-operatively. But again, the movement of the water can freak out some dogs as they step on or lie on it. The main benefit of a cooling bed is obviously to provide a cooler place to rest but the medical benefits should not be overlooked. It takes only minutes for an overheated dog's health to become detrimental and may even result in death. Cooling beds are also a great treatment for any pain and swelling, elbow or hip dysplasia and is also great for senior dogs that suffer from arthritis. They can also aid any irritations that may be caused by skin conditions as the bed will cool any itchy irritated skin. It's all about the comfort for your pet, so choose wisely and consult with the point to see if you can exchange the bed should your pooch not take to it. 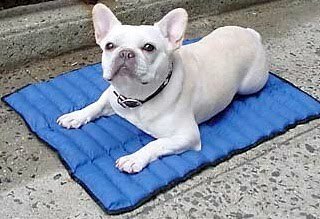 Need to keep your pooch cool during the warmer months? Check out our amazing range of cooler beds right here.